Arabic Type design and development remains one of our key areas of focus at Tarek Atrissi Design. This year hasn’t been an exception, and we have worked on a couple of high profile type design projects which we will be showcasing soon (probably by end of the year). Meanwhile, we showcase below a selection of custom and self initiated fonts that we previously designed – between 2008 and 2010- and that we haven’t had the chance yet to preview them on our blog or website. 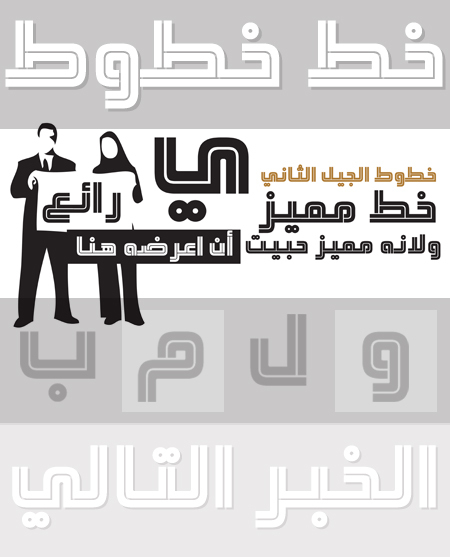 Alif Alif typeface was conceived for a new TV and Radio channel in Saudi Arabia. 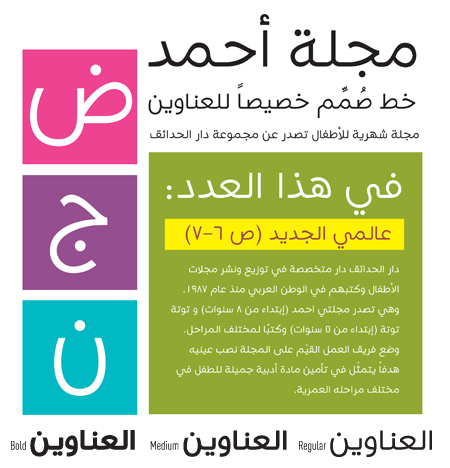 The Arabic and Latin custom designed fonts come in a family of 5 weights: Light, regular, italics, Bold and Extra Bold. Shown above are samples from the type specimen, and below are samples of the font usage as part of the advertising campaign for the radio channel. Based on an initial design we have made for a custom Arabic font as part of a TV channel identity system, Khoutout font was significantly adjusted and developed further as a design over the last 3 years to create a visually distinct and recognizable Arabic typeface suitable for use as a display font in corporate identity programs. Khoutout, meaning “lines” in Arabic, is composed out of two parallel lines with a negative white space in between. It is available for purchase and licensing in our Arabic Font Shop at www.arabictypography.com. 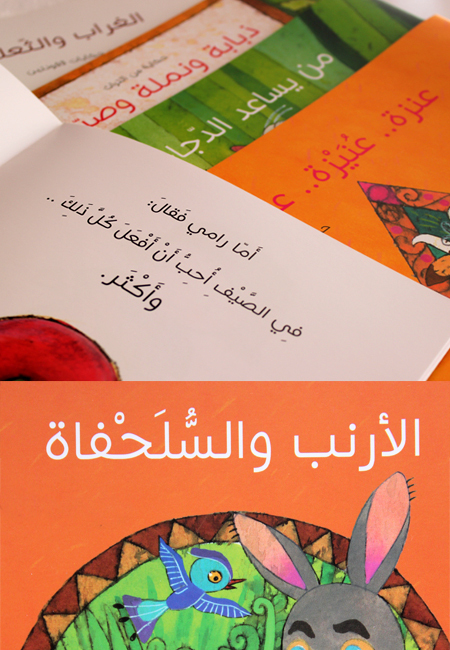 Starting as a commission to design a custom Arabic typeface for the titles of the Lebanese children’s magazine “Ahmad”, the font is now used as well by Dar Al Hadaek publishing house for book cover titles and as a text font in some selected children’s books. The font, designed in three weights, has a friendly look and feel yet is classic in its overall design and is therefore easy to read for Arabic children. It has been vigorously tested and adjusted over the period of two years based on analyzing published samples of the magazine. A custom designed Arabic font for Nokia Middle East and Iran, mostly for use in web, print and outdoor marketing as well as various advertising material. The Arabic font, designed in three weights, was the result of a lengthy design process – defining the needs for Arabic typographic communication at the time while visually balancing the used typographic guidelines of Nokia. 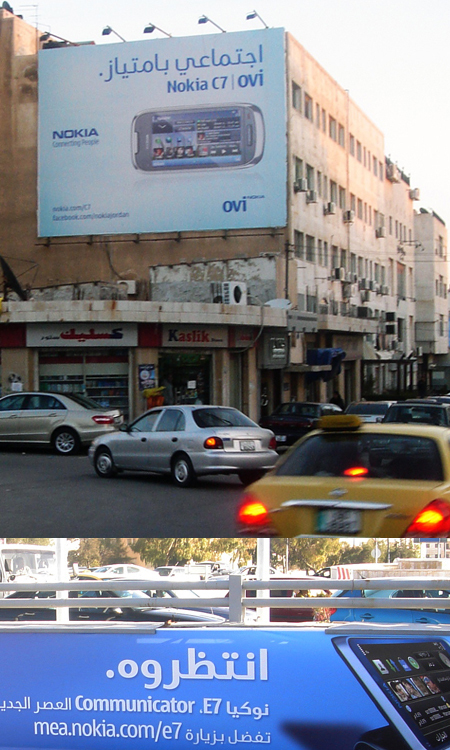 Shown below are samples of the font in use, in large outdoor advertising in the streets of Amman, Jordan. 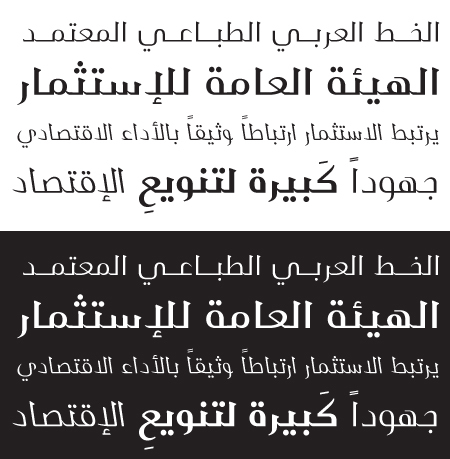 This is a custom Arabic fonts family for Sagia – Saudi Arabia General Investment Authority – consisting of 6 weights. The Arabic typeface was designed as an adaptation for an existing Latin serif font which shares with it a similar weight and features, yet retain its own characteristics as an Arabic script. Below is a type specimen of the font in its varying weights. 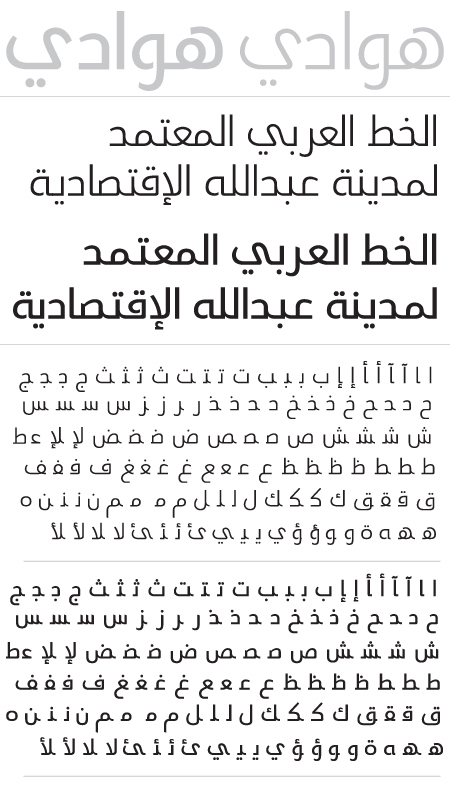 Al Hawadi Arabic typeface consists of two weights, regular and bold. It was a custom design for the King Abdulaziz Economic City in Saudi Arabia, designed to work along with a Latin sans serif font. Previews of the font and the basic character set are shown in the image below.